This is an important piece on how we should not over-interpret the meaning of this very close election. If 1 out of 100 voters flips their vote, Clinton wins handily. While I do think liberals should care more about the plights of conservatives – and vice versa! – the larger takeaway is that the nation is extremely and evenly polarized. -Trump may push for protectionist policies that appeal to unions and the working class, both traditionally Democratic. The UAW president just announced support for Trump on crushing NAFTA. -Democrats may move farther left on social justice, campaign finance, student loans, and progressive taxes to activate millennials who love Sanders and Warren. -Pre-election, Trump was kinda socially liberal, supporting marriage equality, abortion rights, and even transgender rights. He reversed during the election but if he returns to his original views, he would neuter the religious right. Trump is so wildly inconsistent that it’s hard to say where he pulls his party. His famously short attention span and lack of principles could lead him to reverse his stances on whims. Congress might corral Trump as he learns he needs them to pass anything, but maybe Trump can rile his base to keep Congress in line. We may see more conflicts between a president and his party than we’ve seen in a long time. 1. #RuralLivesMatter. Democrats shouldn’t abandon substantive issues but should value rural whites more than spotted owls and bathroom signs, especially if they want those people to not elect a psychopath. Political capital is limited so you have to prioritize. 2. An exchange program that subsidizes rural and urban people to switch locales for a bit. I suspect for many, it’d be like visiting a different country inside the same country. How many of us have been to a NASCAR race, an evangelical mass, or a firing range? How many long-term rural residents have been to a four-star restaurant, an engaging college lecture, or a yoga class? If we travel to gain a new perspective, maybe we’d benefit from starting at home? We could make it a reality series. President Trump could host it! “When something is described as a toy, that means it has everything an idea needs except being important. It’s cool; users love it; it just doesn’t matter. In an upcoming future where abusive behavior may rise, instant video recording will become important. Google Glass ($1,500 in 2013) and Snapchat Spectacles ($130 today) were widely criticized as expensive toys. “After the summer of ’82, Arafat became more than ever a symbol, and maybe nothing more than a symbol, of the Palestinian refusal to disappear. He was judged by Palestinians less for what he produced than for what he represented. Skeptical that basic income is coming soon? 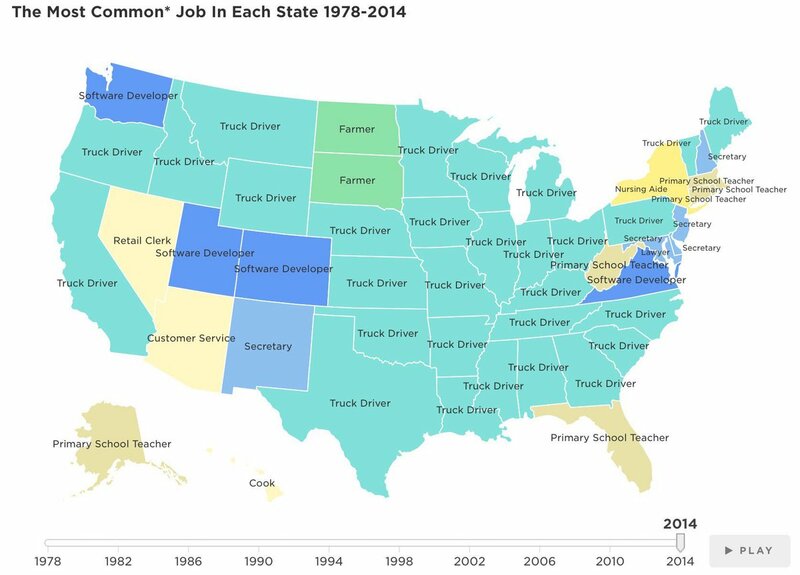 The most common job in 29 states is truck driving: 3.5 million drivers nationally. It’s one of the last middle class jobs that doesn’t require much education. Self-driving trucks are being tested now and will hit the road next year. They will significantly speed shipping and drop prices for nearly every good in America. However, millions of truckers will need a way to get by. Note this includes plenty of red states and blue states. This is why basic income will be a bipartisan issue. Survival trumps ideology. Happy new year! This is a time for new resolutions so I thought I’d share tips from the book Willpower: Rediscovering the Greatest Human Strength. It’s written by a leading willpower researcher and a NYT science writer. 1. First we had to make the computer recognize her Motorola Cliq. The Motorola rep said she should just plug in the USB cable and click “my computer”, which is already confusing to a novice PC user but malpractice to a Mac owner like my mother. Poor interfaces use nouns. Good ones use verbs because that’s how consumers think. Engineers want to describe things, consumers want to do them. 2. “Nothing is happening”, she says. She says this a lot when we’re troubleshooting. I view her Macbook screen and she’s right, no apparent changes. I minimize four windows on her screen and there it is, a new dialog box that was hiding behind all the other windows. How would my mother know that was there? The icon didn’t have text like “Full screen” and a newbie could reasonably think four outward arrows meant exit, or surround sound. Most tech novices don’t try to decode hieroglyphics and some are scared to experimentally click, just as most of us wouldn’t try either on an airplane dashboard. It’s all just filed in Stuff I Don’t Understand. 4. Now we have the photos on her computer. “I want to post my car on Craigslist. Where do I put the photo?” She’s used to click-and-drag so the concept of a web field that holds text which links to a photo is understandably bizarre. The whole separation of computer and internet can seem to a novice like brain and mind. Aren’t they the same thing? The file upload button is named “Browse…”. Why Browse? My mother doesn’t want to casually explore her computer for exciting new photos; she has exactly one that she wants to find and upload. When the photo is uploaded, the only confirmation she gets is a file location in the text field and Craigslist’s green O instead of a red X. A thumbnail is too fancy for the wizards at Craigslist. We had a dozen issues like this – tech idiosyncrasies that anyone born after 1980 learned as native tongue, but everyone before is trying to deduce. What is a URL? When do I single-click and double-click? What’s the difference between downloading and installing? My mother had downloaded several programs that “weren’t working” because she never installed them. It took metaphors like “you brought the package into the house but didn’t open it” to explain. My generation tends to snicker about our parents’ difficulty with technology, but the reality is that it is still too damn hard. We benefited from learning young. Technology forced our parents through arguably the fastest paradigm shift ever – physical to digital. I often think about what shifts my generation will struggle with. Virtual reality? Neural implants? Already I am confused by the habits of teenagers. Why would you use Facebook’s inbox and texting when Gmail is so much better? Why would you send racy photos that are so easily forwarded? Why broadcast so much of your private life to a public world that will remember it, and maybe use it against you, forever? This is what getting older feels like. Here’s hoping old age brings more wisdom than WTF.